We're halfway through yet another exhilarating Premier League season that's has thrown up its fair share of surprises and upsets. Liverpool leads the pack at the halfway mark, having dropped only six points so far. Tottenham Hotspur are a surprise entry at second, trailing Klopp's men by six points, with Manchester City and Chelsea rounding off the top 4. On the other end of the table, only 2 points separate Burnley, Fulham, and Huddersfield in the relegation zone. New boys Wolverhampton Wanderers have settled into the Premier League well, sitting 10th on the table with 26 points. Unai Emery faced the herculean task of replacing Arsene Wenger at Arsenal, and the Spaniard's intelligent moves in the transfer market and his impressive tactics have taken Arsenal within two points of Chelsea at 4th place. Chelsea themselves haven't been too bad, apart from recent defeats to Leicester and Wolves. Maurizio Sarri is still getting accustomed to life in England, and the Europa League seems a very attainable target in his first season at Stamford Bridge. Manchester City started the season where they left off until three defeats in four matches derailed their title challenge. They find themselves a point below a brilliant Tottenham team that is still yet to draw this term. We've seen 3 managerial changes. Slavisa Jokanovic has been replaced by Fulham with Leicester City cult hero Claudio Ranieri, and Southampton removed Mark Hughes, roping in eccentric Austrian Ralph Hasenhüttl. But the most high profile and the most shocking departure of the season is Jose Mourinho, with the Portuguese tactician being sacked by Manchester United after an underwhelming start to the season. A 3-1 loss to Liverpool at Anfield was the final nail in his coffin. Interim boss Ole Gunnar Solksjaer has made a brilliant start, scoring a total of eight goals in two their wins against Cardiff and Huddersfield. With Chelsea and City slipping up in recent games, the race for the top 4 has come alive in a matter of days. With only Southampton and West Ham left to play, let's take a look at the best XI of the Premier League after Gameweek 19. 25 matches into his Liverpool career, there really isn't much fault you can find with the Brazilian keeper right now. He's provided a stable, level-headed alternative to Mignolet and Karius, he's good with the ball at his feet, and he leads the Golden Glove charts with 12 clean sheets. That's 4 more than anyone else. Alisson was Klopp's biggest arrival last summer. 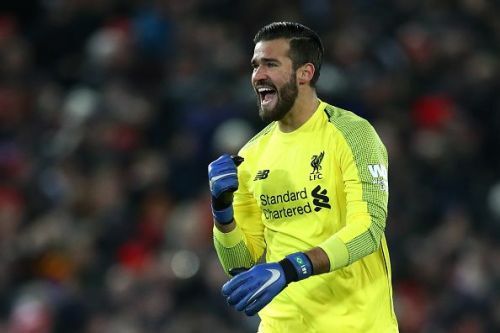 He took a gamble in spending £55.5 million and breaking the world record fee for a goalkeeper (albeit only for 3 weeks), but the 26-year-old has managed to solve arguably the biggest issue Liverpool have faced for the better part of a decade. Rival fans will probably point out his mistakes against Leicester and Manchester United, but let's not forget that he still has plenty of time to improve.